The casino game software designer/developers over at Aristocat parlayed their success with the company’s Chilli Gold slot into a sequel, More Chilli. The symbols have changed (except for those mundane A, K, Q, J, 10 and 9 symbols, naturally), with the ridiculously innovative bonus rounds of the company’s More Hearts slots game included. Much bonus coinage awaits. So what are the symbols in the More Chilli slot? The blue parrot and donkey have also been evicted for More Chilli, replaced instead by a blue chihuahua. At least, we think it’s a chihuahua. Perhaps an offspring between a chihuahua and one of the smaller marsupials... And though the artistic style behind the game’s design is noticeably different, our protagonist remains from Chilli Gold. Hilariously, the game instructions refer to him only as MAN, so we’ll do so here because it amuses us. And MAN, he is wild. Is the bonus round in the Chilli slot just as good as in the first game? You bet your suegra loca! 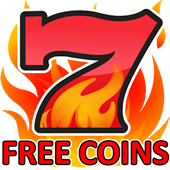 Clearly, the Aristocrat folks are proud of this wild (so to speak) innovation to the free spins bonus round and have reinstalled the feature in the More Chilli slots game. For those not in-the-know, the exciting explanation runs below. Three or more scatters (Simmons’s money bags) triggers what they call the “Mega Pay Feature.” The Mega Pay feature may also be triggered after any random spin, but this is quite rare; most times it’s entered through the five-scatter method. Once in this bonus round, the player is greeted by the welcome sight of *two* full set s of reels – and things can only get better! During this round in More Chilli, you’ll want to collect the red chili symbols. With nine of these are accumulated during the free spins, a third reels is sprouted and free spins continue; additionally, reels 5 become filled with stacked wilds. Accumulating 14 peppers awards yet another set of reels, and all reels 4 and 5 are filled with the wilds; finally, lucky players racking up 30 chili peppers play with reels 3, 4 and 5 on all four sets of reels. Nice. How much can I wager in the More Chilli slots game? 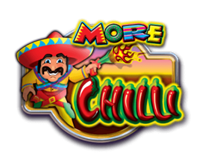 The More Chilli has 25 paylines and is touted as including the “+5 Extra” “feature,” meaning if one wagers on an additional (non-existent) five paylines, he/she will be awarded with more free spins in the bonus round. However, the 30-payline wager seems to have become the default in the More Chilli slots game, so figure on wagering between 30¢ and $150 per spin.